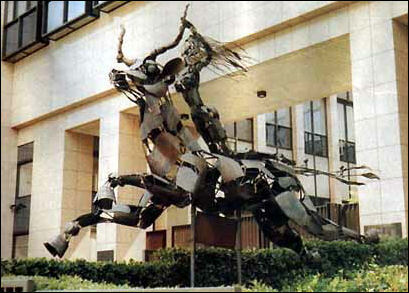 Photo to Right: A woman riding a beast is displayed outside the headquarters of the European Union (Revelation 17:3). It is just my opinion, but I feel that the Rapture is near. The New World Order will soon be complete. I am NOT setting any dates. The Bible clearly states, "Watch therefore, for ye know neither the day nor the hour wherein the Son of man cometh" (Matthew 25:13). No one knows for certain WHEN the Lord will return; but the New World Order is upon us, and all signs point to the coming of the Antichrist. "In a moment, in the twinkling of an eye, at the last trump: for the trumpet shall sound, and the dead shall be raised incorruptible, and we shall be changed. For this corruptible must put on incorruption, and this mortal must put on immortality" (1st Corinthians 15:52,53). “For the Lord himself shall descend from heaven with a shout, with the voice of the archangel, and with the trump of God: and the dead in Christ shall rise first: Then we which are alive and remain shall be CAUGHT UP together with them in the clouds, to meet the Lord in the air: and so shall we ever be with the Lord” (1st Thessalonians 4:16-17). People today who claim that the teaching of the Rapture is a new doctrine, only a couple hundred years old, are ignorant of the Scriptures. As you just read, the Bible plainly teaches that all believers shall be “caught up” to be with the Lord in the clouds. As I look at the events of the world today, and the stage being set for the coming Antichrist, I personally believe that the Pretribulation Rapture is near, i.e., the Rapture will precede the 7-year Tribulation Period. The Bible plainly states that no man knows WHEN the Lord will return (Mark 13:32), which means that the Rapture MUST come before the Tribulation Period. The reason is because the Bible plainly states that the Second Coming of Christ will happen 3 1/2 years AFTER The Abomination of Desolation, i.e., when the Antichrist declares himself to be god and demands worship from the masses of the world (Mark 13:14; Daniel 9:27; 2nd Thessalonians 2:4). So it will be KNOWN exactly how much time remains before the Second Coming, once the Antichrist declares himself to be god from the temple in Jerusalem. If you study the King James Bible at face value, you can only conclude a Pretribulation Rapture. The leaders of Germany and France along with former British Prime Minister Tony Blair have all called for a new global order in the wake of the financial crisis. 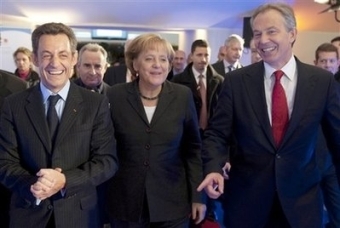 Blair, German Chancellor Angela Merkel and French President Nicolas Sarkozy all made the tandem appeal at a conference in Paris on the future of capitalism. Merkel criticized what she described as a lack of regulatory powers afforded to global bodies such as the IMF, stating that it has “not managed to regulate global capitalism”. The German leader called for the creation of a new global economic body under the UN, similar to the Security Council, to judge government policy. Both Sarkozy and Merkel have previously called for a new global financial order, along with Top EU officials and current British Prime minister Gordon Brown, who has repeatedly stated that the financial crisis should be used to make world leaders agree to fresh rules and regulations. The leaders will meet again, along with a host of other world chieftains, to discuss the global economy in London on April 2. There is an empty seat today in parliament at the European Union, and it is seat number 666. I believe that the Antichrist is alive today and is being prepared to lead; however, the Bible plainly teaches that the identity of the Antichrist won't be confirmed publicly until after the Rapture (2nd Thessalonians 2:7,8). Many people today are trying to figure out "who" the Antichrist will be; but the Scriptures tell us in Mark 13:37 to instead WATCH FOR JESUS' RETURN... "And what I say unto you I say unto all, Watch." That should be our heart's desire as Christian believers... the Lord's return. We are witnessing the consolidation of power (control) over the world's natural resources, religions and economic systems under the influence of a single entity, i.e., the Illuminati (a group of elite occult members with a diabolic agenda to bring to fruition a Godless Global Totalitarian Communist Police State, which will be led by the Antichrist). This is Satan's sinister plan, and it's been in the works for thousands of years. Truth is certainly stranger than fiction. I believe that the New World Order will be completed within the next decade and that the Lord's return is ever so imminent. Even so come Lord Jesus!